Take the mind, for instance. 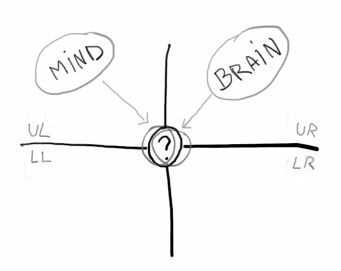 It's okay to say that the mind is "in" the UL quadrant, as long as we know that "the mind" is a mental construct that we humans created to refer to something mysterious that we experience. Defining the mind as a UL object only shows that we are looking at "it" from the UL lens. It's a UL perspective on a mysterious object, which naturally reveals (or enacts) its UL dimension. Looked at it from a UR perspective, we see its UR dimension, which we happen to call brain. And this thing in the middle is, in many ways, a mystery. As we use these conceptual tools, let's never forget that our constructs are useful distinctions to think about things, they are not the actual things1. The world really is mysterious. 1. Actually, it's even more complex than that. According to Integral Theory, actual things are not simple objects existing independently of us engaging them. For more of that, see Wilber's Integral Spirituality (2007), especially appendix III on "The Myth of the Given", or for an even more advanced inquiry, see An Ontology of Climate Change: Integral Pluralism and the Enactment of Multiple Objects (2011), by Sean Esbjörn-Hargens.